They have stunned audiences across the world, now Australian audiences will have an opportunity to experience Montreal’s the 7 Fingers (les 7 doigts de la main) and it’s thrilling Traces, when the company tours across Australia for the first time. Combining traditional circus forms with theatre, contemporary dance and urban sports, Traces strips away the hi-gloss, high production values of the world’s most famous circuses to bring performance back to its raw physicality. Live drawings form a spontaneous animated backdrop, and a ‘home made’ grand piano is played by each of the five characters who manage, between somersaulting, contorting, and catapulting effortlessly around the urban space, to speak openly about their lives and relationships, weaving notions of memory and survival into the production. 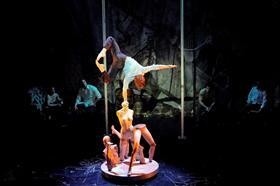 The 7 Fingers (les 7 doigts de la main) was founded in Montreal in 2002 by seven seasoned circus performers. This group of friends had worked together in such prestigious companies as the Cirque du Soleil, the Cirque Eloize, Wintergarten Variety, Teatro Zinzanni, and Cirque Kniel, who ‘ran away’ to create their own circus of an entirely different flavour. They amazed Australian audiences with their performances in Melbourne as part of the 2006 Commonwealth Games Cultural Festival and now return for their first national tour.